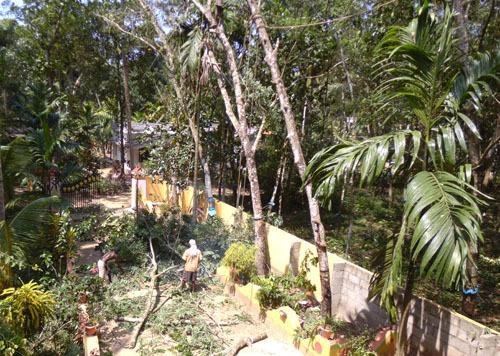 Indian Prime Minister Manmohan Singh has asked every villager to use firewood instead of LPG cylinders for cooking food.He vowed to remove subsidy given to 6 gas cylinders per year to a household.So i obliged him by obeying his advice and uprooted 5 rubber trees near my house. I hired a contractor to do it for Rs 4000.The guys were experienced folks. Four of the trees were standing between two walls.I did not wanted the walls to be destroyed. However the activity took so much time because of the risk in the four trees to the walls. One of the wall was a two feet high wall to seperate the pathway to the house. Other side was the boundary wall.Still the small wall got damaged. But they repaired it by putting the broken part back to the wall and applying cement grout as glue.